This item is too large to ship. Buyer can pickup or have delivered locally. You are purchasing 48" (4') wide x ### in length (300 or 500). Buyer has the option to have that roll as a single uncut roll, or converted to have two 24" rolls or four 12" rolls. We offer the following sizes and roll lengths. This item is sold by the UNIT of 1, 2 or 4 rolls. You can choose between one single roll, two 24" rolls or a solid 48" roll. All rolls are perforated every 12 inches regardless of the width unless requested otherwise in advance. Typically, most buyers buy the smaller of the two and businesses buy the larger size. The smaller size would be considered "regular" and the larger size is considered the "industrial" size. You do not have to have a business to buy the larger rolls. Buy the larger rolls if you need the material and want the discounted prices. Understanding Bubble Wrap: Bubble Wrap is one of the most complicated items for buyers to understand, so hopefully our comments below will help you better understand bubble wrap lingo. Bubble Height: The 48" height of the roll is the total height in inches as the roll while sitting upward. If you imagined a barrel sitting up, it's the same thing. All bundles, rolls or units start at 48 inches. If you buy a full unit or bundle, you are buying a total of 48 inches in height / width. The length of the roll is something different. Bubble Length: The length, 300', or 500' etc... is the length of the entire roll in FEET. The 12, 24 or 48 is the width of the bubble. Slit: The term slit means where the 48 inch roll is cut. If you buy a full roll at 48 inches and want the roll slit 24, the roll is cut in half and you get two 24" rolls. Slit 24 and slit 12 are the two most common sizes. If you want slit 12, you will get four 12" rolls totaling 48 inches. Perforation: Perforation means where you can tear the bubble just as you would a paper towel in your kitchen or toilet paper in your bathroom as it's unrolled. 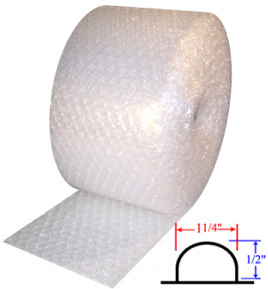 All of our bubble wrap is perforated every 12 inches for easy tearing. Use the PRODUCT OPTIONS area above to select your desired width and length. Prices will display based on your selection. We are one of the largests distributors in Florida. Huge discounts for volume purchases. Local Pickup / Delivery Only.